The grenade was blown up on Lossiemouth's East Beach. Elgin residents made the alarming discovery while digging at the rear of their property at the weekend. Yesterday, the device, which is believed to date from the Second World War, was blown up after experts travelled from Edinburgh to remove it. Several unexploded bombs are reported every year on beaches and in woodland along the Moray Firth coast. However, discoveries in residential areas of major settlements like Elgin are relatively uncommon. Last night, the Seafield Crescent locals who reported the explosive revealed its discovery had come as a shock. One resident, who asked not to be named, said: “My husband was just digging in the garden when he came across it. We have no idea where it came from. “I know you have to report these things. The bomb disposal people came, looked at it on Sunday, then came back to move it on Monday. They had to cordon off the street while they did it. A cloud of smoke and sand was created when the grenade was detonated in a controlled explosion near the bridge to Lossiemouth’s East Beach. During July an artillery shell was discovered by a farmer in one of his fields near Forres before the device was taken to Roseisle to be detonated. 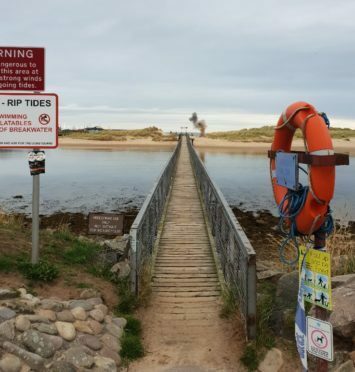 Last year, Coastguard teams issued a warning after enthusiasts with metal detectors between Findhorn and Nairn dug up a rusted bomb from the Second World War at Culbin. The warning came just a day before four devices used for training surfaced on the coast about seven miles east of Nairn. A police spokeswoman said: “The grenade was reported to us at about 5pm on Sunday from an address in the Seafield Crescent area of Elgin.